The major and minor pentatonic scales are used all the time by guitarists ­ they have a simple, yet satisfying and natural sound, that is a common factor in many musical traditions across the planet. Almost all lead guitarists playing pop or rock will quickly figure out a few pentatonic licks, that they can keep handy and bust out all the time. However, one thing we should keep in mind when learning, is that those repeated licks and other idiosyncrasies we develop in our playing will stick with us as we progress ­ a guitarist is nothing if not a product of their environment. So, when we learn, we should always keep an open mind. “Killer licks” sound fantastic and can often be the high point of a solo ­ but what we really want to be able to play, is whatever pops into your head in the moment! This is why it’s important to always work on fluency ­ knowing a scale inside out, all over the neck, and always trying new ways of playing and thinking about the possible sounds that can be made. 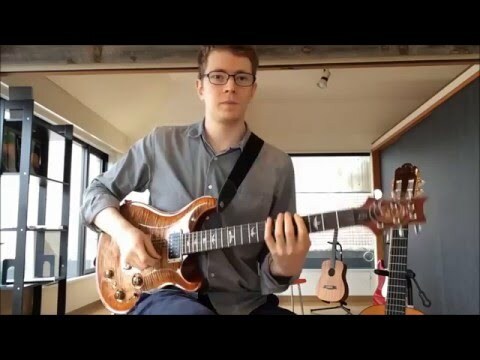 If you find yourself playing licks more than 50% of the time, try relaxing and playing something new, simple, and melodic instead ­ maybe you can discover something new, perhaps in a different position on the neck. For a basic example, playing one scale over one chord is a fun and easy experiment and see what each interval sounds and feels like compared to the root chord. Try playing an A major pentatonic over an A major chord, you can quickly understand what each of the five notes feels like ­ and then start to experiment with sequences of notes. Playing over a sequence of chords is of course harder ­ if you stick to one pentatonic scale, each note of the scale will sound different depending on which chord you’re at. Advanced improvisers will need to be fluent in many scales, to navigate progressions without resorting to licks developed for that particular song ­ but you can bet that they’ll still have a few licks stashed away in their bag, that can be brought out when they feel it fits the rest of the solo! Cheers and as always, have fun.